All the lesser known stats from Chennai Super Kings’ first win at the Eden Gardens since 2013. 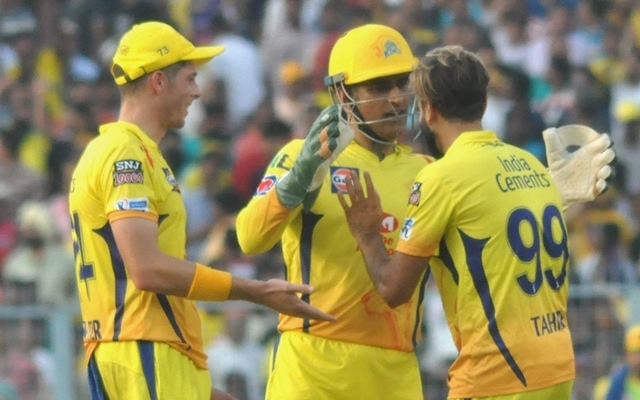 Not often any team had their 7th win of the season by their 8th game while no other team has even five wins before the Chennai Super Kings in this season. The 3rd consecutive win after their first defeat now has put the Super Kings one win short of sealing their place in the playoffs. The Kolkata Knight Riders once against struggled against the CSK bowlers as Chris Lynn alone scored 82 out of the 161/8. During the game between these two teams in Chennai, Andre Russell scored 50* but KKR managed to finish with 108/9 in their 20 overs. Suresh Raina remained unbeaten for the 18th time in the IPL while chasing with his team winning on 17 instances. The only time Raina’s team failed to win in an IPL chase despite him being unbeaten was way back in 2008 season. CSK fell 14 runs short of RCB’s total in the game played at the Chepauk. It was incidentally Raina’s first unbeaten innings during an IPL chase. The game was also the only IPL win for RCB against CSK in Chennai till date. Sunil Narine has troubled MS Dhoni with the ball in the past but never claimed his wicket in the IPL. Dhoni played 57 balls for just 29 runs against Narine in the IPL prior to this game. In all Twenty20s, this was the 2nd time in 76 balls that Narine has dismissed Dhoni. During their first meeting during the CLT20 in 2011, Dhoni gave a return catch to Narine, who was playing for the Trinidad & Tobago. With the four catches during the KKR innings, Faf du Plessis became only the 6th fielder to claim as many as four catches in an IPL game. He is also the 3rd to achieve this during the ongoing season after Rahul Tewatia and David Miller who took four catches in the games played in Mumbai. Sachin Tendulkar, David Warner and Jacques Kallis were the first three with four catches in an IPL game which they recorded in 2008, 2010 and 2011 respectively. However, no fielder has taken as many catches in an IPL game between 2011 and 2018. Du Plessis is also the 2nd player to take four catches in first innings of an IPL game. Sachin Tendulkar was the first which he did during the 2008 season game also against the Kolkata Knight Riders. Tendulkar claimed three catches out of those four while standing at 1st slip. Kolkata Knight Riders’ fortunes have turned since the Sunil Narine’s inclusion in 2012 after which the team won two titles. The Caribbean off-spinner got the luxury of playing at the Eden Gardens which is usually has something for the spinners. In the game against CSK, Narine started off with a wicket maiden. The wicket of Faf du Plessis was Narine’s 50th wicket in the IPL at the venue. He thus became only the 3rd player after Lasith Malinga (61 wickets at Wankhede) and Amit Mishra (52 wickets in Delhi) to bag 50+ IPL wickets at a single venue. Narine is also the first player to claim 50 wickets in the Twenty20 format at the Eden Gardens as no other player has even 40 of them.